Stash super-ripe bananas in the freezer—be sure to peel them first, halve them, then put them in a plastic freezer bag or ridged-sided container. They thaw quickly for mashing up quick muffins, bread, or smoothies. 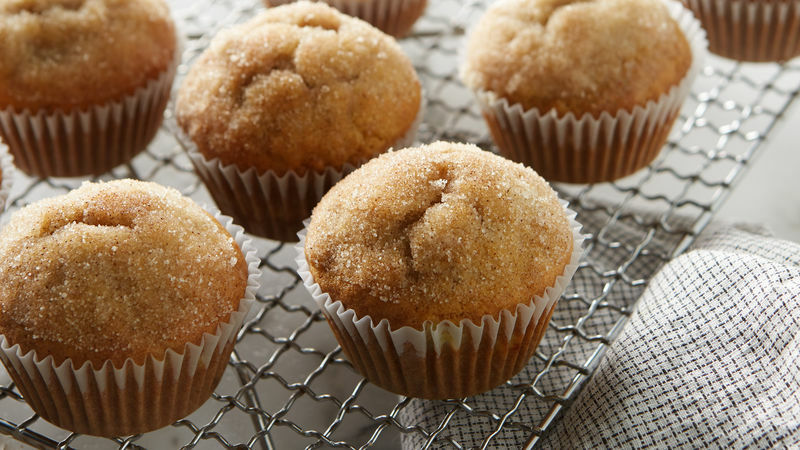 The simple cinnamon sugar topping the muffins, which can be made full size or in a mini muffin tin, can be spiffed up with a full-fledged streusel topping. Mash some softened butter, brown sugar, finely chopped nuts, a dash of any dried spice you like, and some oats together until they form a crumbly paste. Spoon on top of the muffins before baking. Really up the cinnamon quotient and stir some cinnamon baking chips into the muffin batter. Bananas are an everyday staple of our modern diets, but there were not always so readily available. They were introduced at the 1876 Centennial Exposition in Philadelphia, which included a 40-acre display of tropical plants, including banana trees. Tinfoil-wrapped bananas were sold at the exposition, and people fell in love with the sweet and starchy fruit. Soon, home cooks began experimenting with baked goods like banana muffins. If you’d like to learn more about baking with bananas before whipping up your banana cinnamon muffins, follow this step-by-step guide. Remember that easy does it when you’re mixing dry ingredients into wet--the batter should be stirred just until the dry ingredients are moistened. Once you’ve tried these banana and cinnamon muffins, you can find even more traditional favorites, intriguing variations and fresh new takes in this collection of Betty’s Best Banana Muffin Recipes.